This recipe puts a low carb, gluten free spin on an Italian Classic. 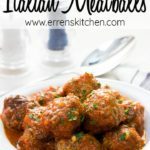 Whether on a Keto Diet or just cutting carbs, with this recipe for Low Carb Italian Meatballs you’ll have a scrumptious gluten-free dish. I’m on a low carb diet but need the Italian comfort food I was raised on so I’ve been coming up with recipes that give the same great taste without the carbs that come with traditional recipes. These meatballs are just what I needed! 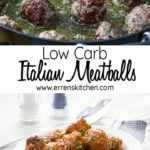 They are low carb but have the same flavors I grew up making with my Italian grandmother. 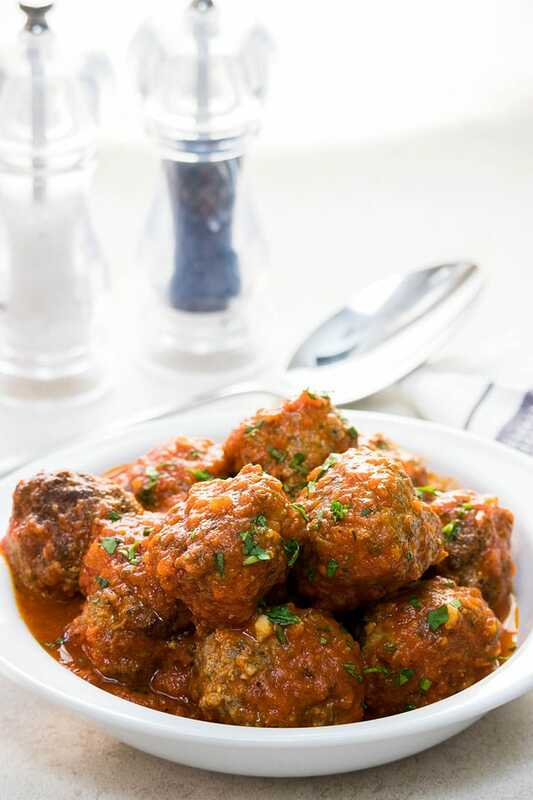 Using meat with a higher fat content makes the meatballs moist and tender without the use of breadcrumbs. The egg helps to bind them and hold their shape. The fresh parsley and grated Parmesan cheese add authentic Italian flavors. This recipe uses only the fat from the meat to add moisture, but there are many ways to add extra moisture, like using cream or shredded zucchini to the mixture. I didn’t want to complicate things so I kept my ingredient list to a minimum but feel free to experiment any way you want. I was raided pan frying meatballs, so that’s what I always do. The crust that forms on the outside is really delicious and my favorite part. Pan fried meatballs are great without sauce and would go great with roasted broccoli or whatever low carb side you prefer. That said if you prefer to bake your meatballs, just throw them on a baking pan lined with nonstick foil and bake on 400F for 15-20 minutes (or until they are fully cooked). 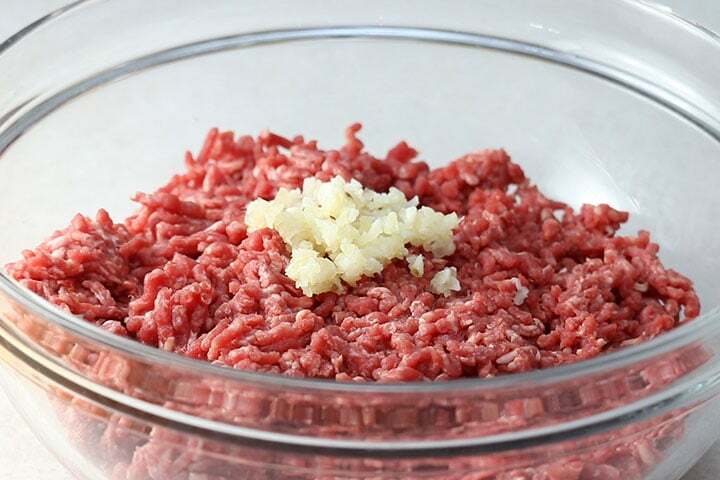 Start with adding the ground beef to a large mixing bowl. I use meat with higher fat content to add moisture. A good rule of thumb is to not pick the reddest meat on the shelf. Choose one that you can see more fat. Add the minced garlic. I like my meatballs spicy so I use 4-5 cloves of garlic for 2 pounds of meat, but this can be adjusted according to taste. 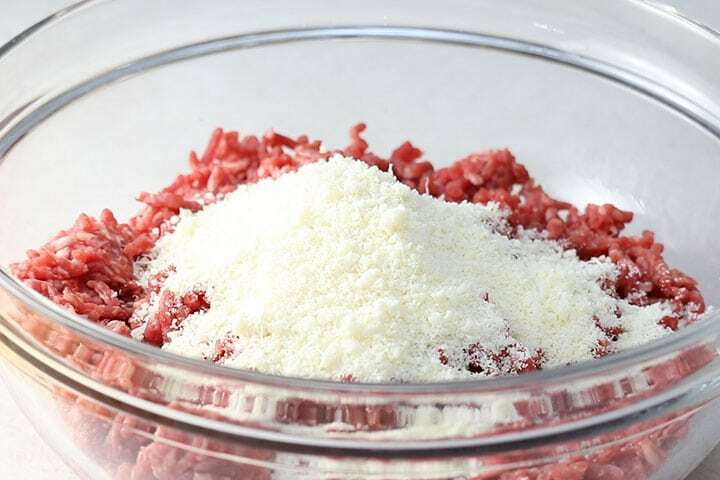 Add the grated parmesan cheese (Pecorino Romano Cheese works well too). Freshly grated cheese works best. 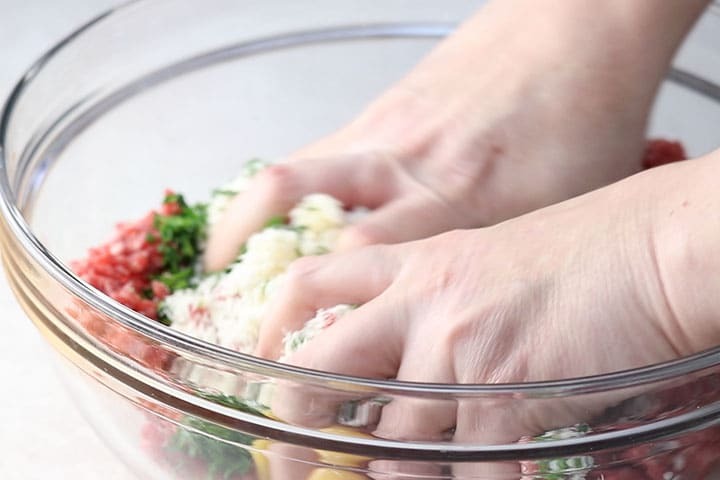 The dry stuff in a can will make your meatballs dry and grainy. Add 2 small eggs (or one large), fresh parsley and season with plenty of salt and pepper. Hand mix (literally). Squeeze the ingredients through your fingers until thoroughly combined. To keep the meatballs uniform in size, try using an ice cream scoop. 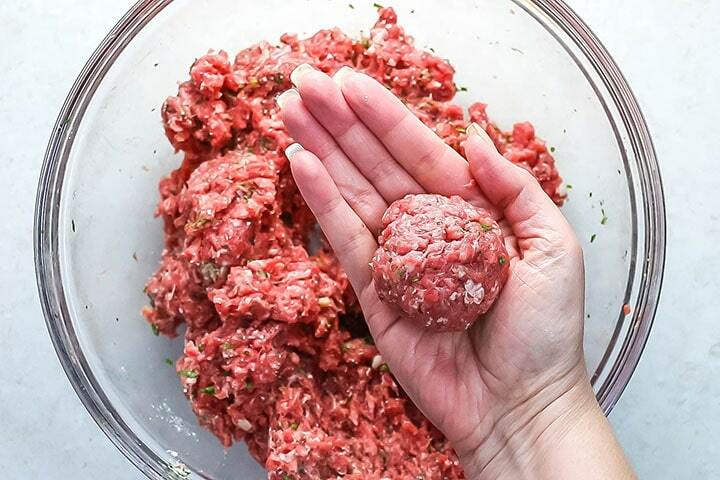 Roll the ball in between your palms to form a meatball. Add to a pan with a 1/2 inch of olive oil. Remove from the pan and transfer to paper towels to blot. Add to low carb tomato sauce of your choice (I use my Simple Marinara Sauce). Cook until heated through. I use meat with higher fat content to add moisture (about 73% lean). A good rule of thumb is to not pick the reddest meat on the shelf. Choose one that you can see more fat. There are many other ways to add extra moisture, like using cream or shredded zucchini to the mixture. I didn’t want to complicate things so I kept my ingredient list to a minimum but feel free to experiment any way you want. Freshly grated cheese works best for these meatballs. 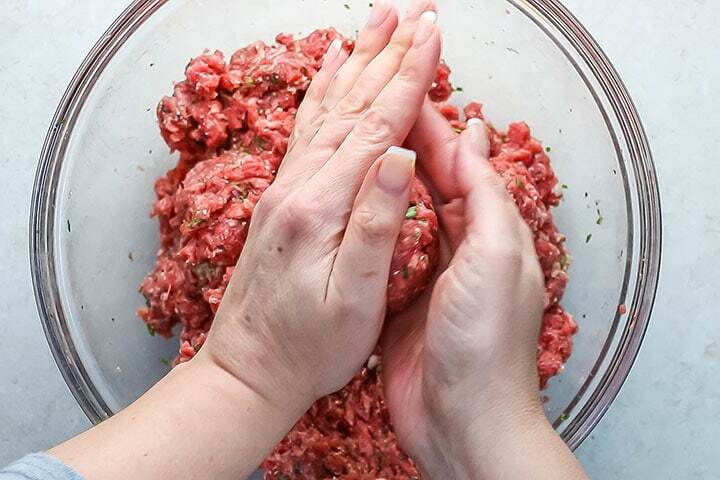 The dry stuff in a can will make your meatballs dry and grainy. Be realistic in your expectations. 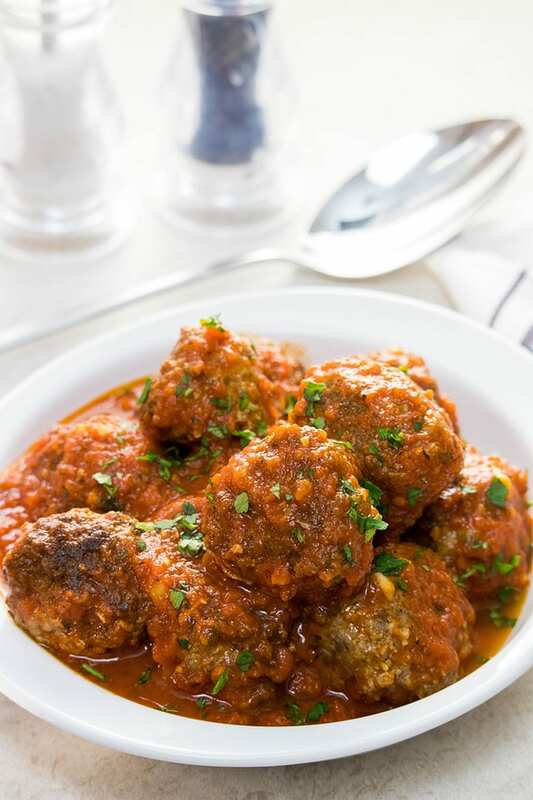 Without breadcrumbs, it’s nearly impossible to replicate a traditional Italian meatball, but this comes really close! To bake instead of pan fry, just throw them on a baking pan lined with nonstick foil and bake on 400F for 15-20 minutes (or until they are fully cooked). To keep the meatballs uniform in size, try using an ice cream scoop you can also weigh them. 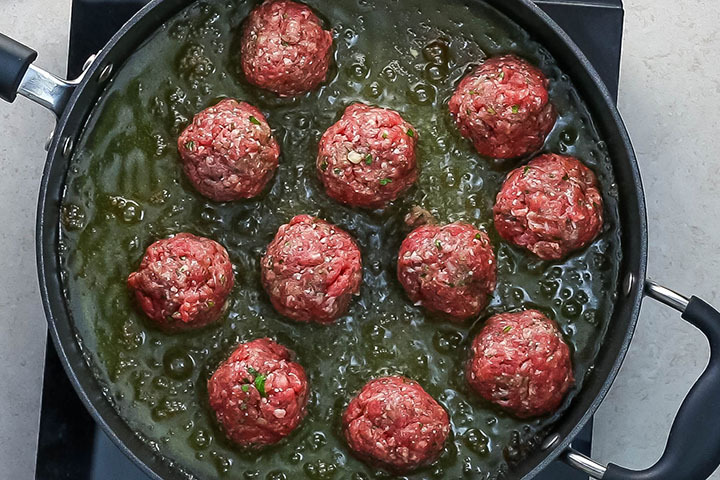 When browning the meatballs, don’t overcrowd the pan. Overcrowding will cause them to steam instead of crisp. 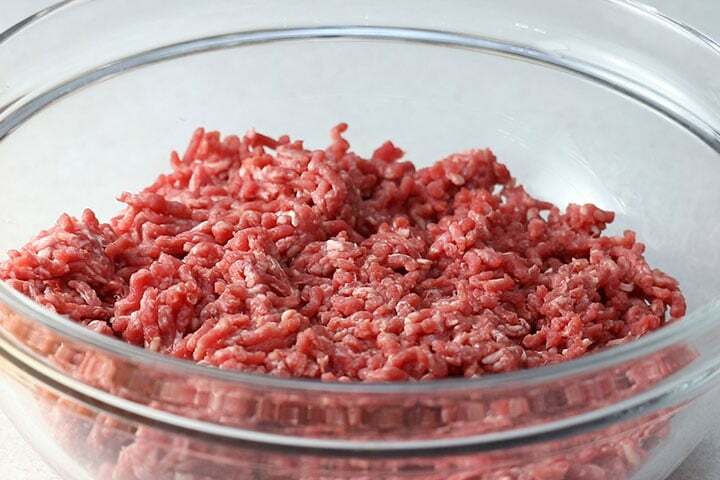 Can Meatballs Be Frozen? Yes, Meatballs freeze really well. 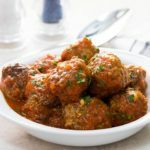 You can add the pan-fried meatballs to a freezer bag and freeze for up to three months or you can freeze them in the sauce in an airtight, freezer safe container. How long can meatballs be stored in the refrigerator? Meatballs can be stored in the fridge for up to 3 days. 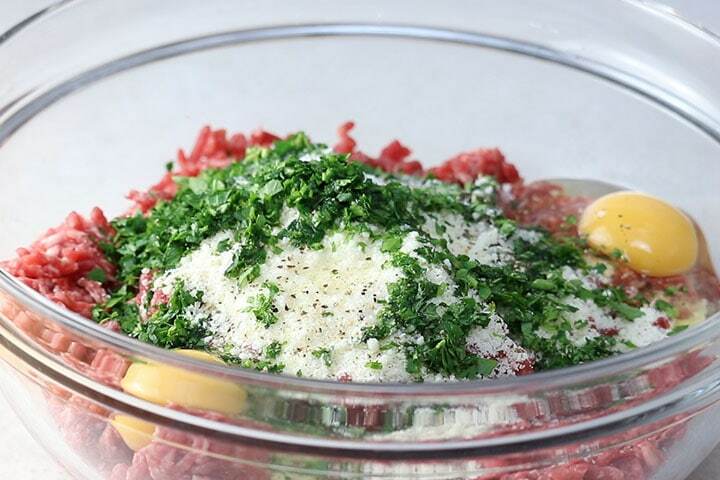 Add the ground beef, parmesan cheese, eggs, parsley and garlic to a large bowl. Mix well with your hands, squeezing the mixture through your fingers until combined. Using an ice cream scoop, scoop some of the mixture into your palm and roll between your palms to form a firm ball. 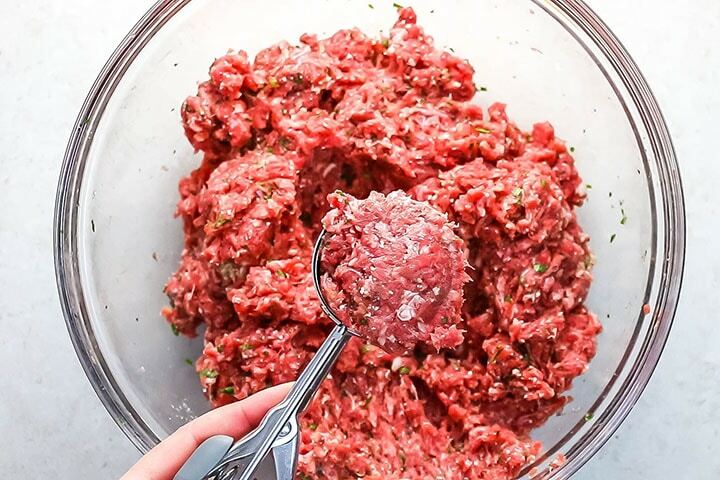 Continue with the entire mixture (24 Meatballs). Heat about ½ cup of vegetable oil into a large skillet. You'll want about ½-inch of oil in the pan. 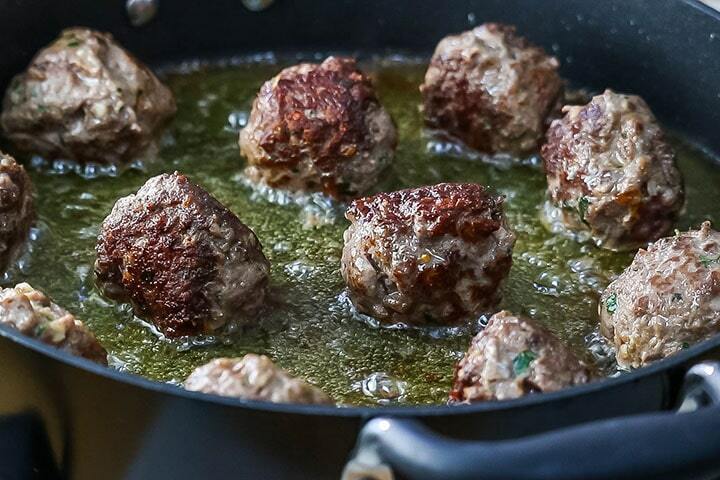 Add the meatballs to the heated oil about 2 inches apart and brown them until crisp, turning with a pair of tongs so that they are evenly browned. Do this in batches rather than crowding the pan. Once browned, transfer to paper towels to blot. Add to low carb tomato sauce of your choice. Cook until heated through. There are many other ways to add extra moisture, like using cream or shredded zucchini to the mixture. I didn't want to complicate things so I kept my ingredient list to a minimum but feel free to experiment any way you want. Be realistic in your expectations. 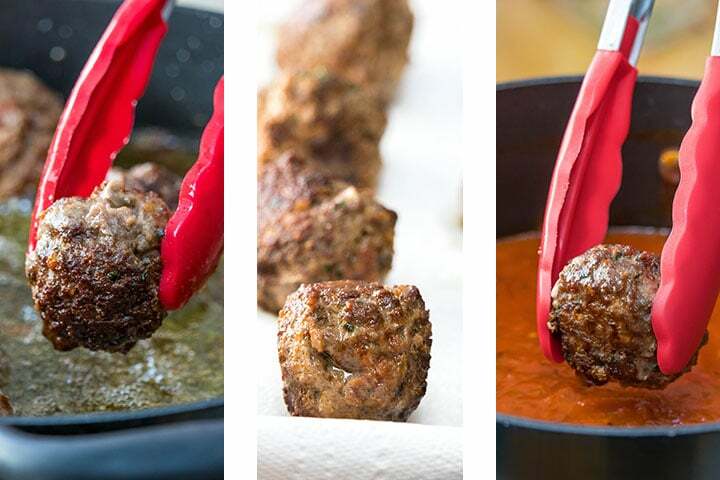 Without breadcrumbs, it's nearly impossible to replicate a traditional Italian meatball, but this comes really close! When browning the meatballs, don't overcrowd the pan. Overcrowding will cause them to steam instead of crisp. Meatballs are an all-time favorite of mine! My husband learned my mom’s recipe (I could never perfect them!) and I love when he makes them! Maybe your recipe could be my meatball go-to! So yummy! Trying this over the weekend! I can’t wait! Meatballs are our favorite dish! I should try your recipe immediately! Thank you so much, Catalina, I hope you enjoy! This gives those on a low carb diet the freedom to not have to miss out on these anymore. They look amazing! Thank you, Demeter, Awesome to hear your feedback! Such great timing on this! I am on a low carb diet and had chop meat to use! Made them yesterday and froze some for other dinners! Thanks, Erren! This is perfect for my family! Can’t wait to give it a try!